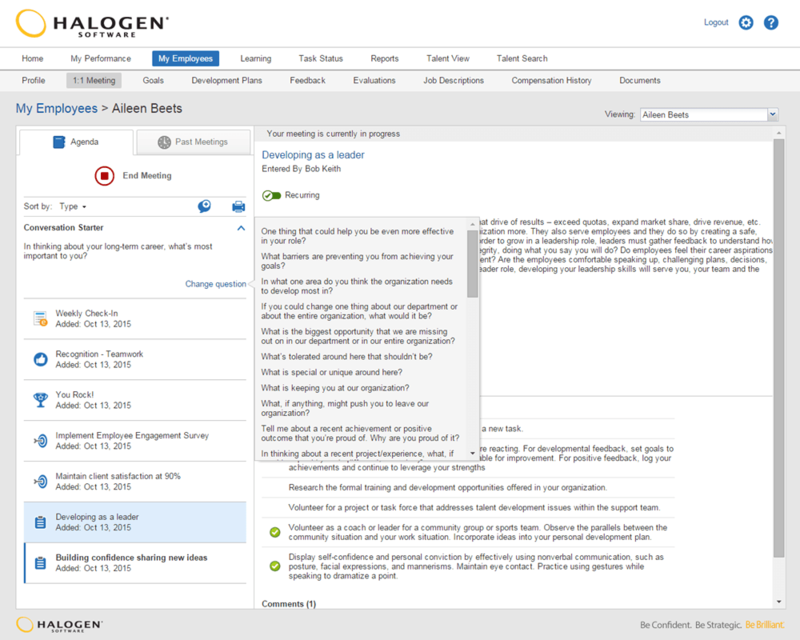 Halogen Software offers an organically built cloud-based talent management suite — Halogen TalentSpace™ — that reinforces and drives higher employee performance across all talent programs — whether that is recruiting, performance management, learning and development, succession planning or compensation. With over 2,100 customers worldwide, Halogen Software has been recognized as a market leader by major business analysts and has garnered some of the highest customer satisfaction ratings in the industry. Halogen TalentSpace™ provides end-to- end, fully integrated applications that were designed to organically support optimal employee performance. Each module works together to streamline talent management operations, while also aligning your workforce with your business strategy. The suite of applications were designed to work together to drive employee performance. Halogen offers industry-specific solutions to address the unique requirements and challenges of companies in healthcare, professional services, manufacturing, the public sector and more. With the Halogen TalentSpace™ suite, employees can get the direction, feedback and development they need to excel. The Halogen Performance™ solution is a powerful, easy-to- use solution for cultivating a high-performance workforce that is completely aligned with your organization’s goals and priorities. It provides reminders for task deadlines and all employees have instant access to their performance data. Users rave about Halogen Performance™ and how it has enhanced both their performance appraisal process and management practices. With Halogen’s eAppraisal™ feature, form creation is automated and fully customizable. They also offer a forms library. Another feature is the 360 Multirater™: a practical, affordable and easy way to gather and analyze rich 360-degree feedback — and give your employees the broad, balanced perspective they need to succeed. Whether you use the solution for leadership development or to collect broader, fairer feedback for employees, Halogen 360 Multirater™ does away with the paperwork and hassles associated with 360-degree feedback. Gather feedback from managers, peers, subordinates, and even external contacts, such as customers and suppliers. With countless features, Halogen TalentSpace™ is a comprehensive performance management software offering a consistent and user-friendly interface for every user. Halogen Software’s powerful, yet simple-to-use solutions are used by organizations that want to build a world-class workforce that is aligned, inspired and focused on delivering exceptional results. We recommend it to any medium-to-larger business looking for an all-in-one talent management solution, but especially those businesses looking for a modular solution that will allow them to adopt as much or as little functionality as is required. Have questions about Halogen TalentSpace™? Want to find out more about human resources management software? Call, click, or email to speak with an unbiased Technology Advisor for a no-cost, no-obligation consultation on your unique requirements. Learn everything you need to know about Halogen TalentSpace. Our experts will reach out to you shortly.